Ralph McQuarrie is famous for his work on Star Wars, but he got an Academy award for Cocoon. One of my favorite movies when I was a kid was Cocoon starring Steve Guttenberg. It starred some of my favorite actors and the special effects of glowing aliens with removeable skin suits just seemed like the coolest thing in the world. The Academy agreed and they got an Oscar for "Best Visual Effects." McQuarrie described his designs this way. "The script described a glowing alien, it was still a work in progress as I worked on the film. I envisioned the aliens as a light bulb that's too bright to look directly at." KEN RALSTON, the Visual Effects Supervisor chimed in. "I was lucky enough to work with Ralph on Cocoon. He took Ron Howard's vision and absorbed it, expanded upon it , and visualized it all in a series of striking images. The saucer, the aliens, all the other invaluable ideas he produced once again inspired my visual effects team to achieve something special." Ralph is a big reason why we were honoured that year with the Oscar for best visual effects. Simply stated Ralph McQuarrie has the ability to paint dreams." Sorry about the really small images. 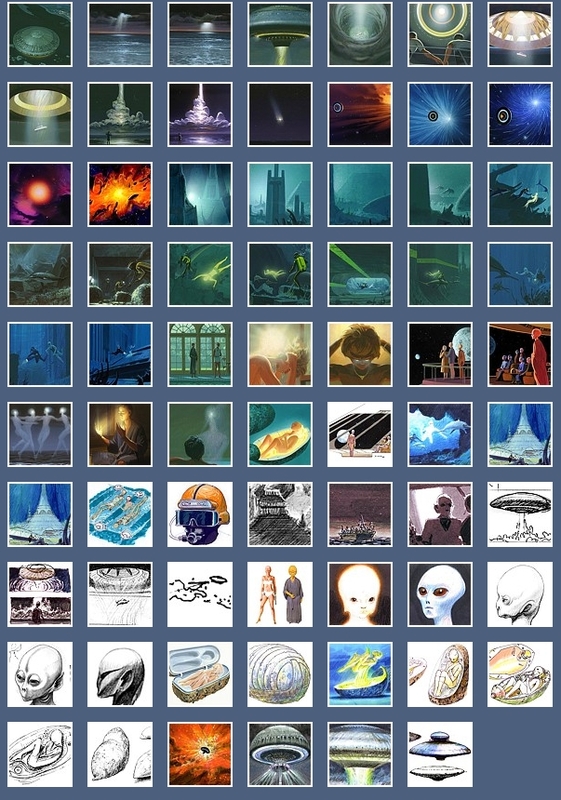 I can't find any art online, but I did find some thumbnails on McQuarrie's site. I couldn't decide which to share so I just did a screen capture. Here's the trailer which shows some of the effects . You can actually buy signed prints of his artwork at http://ralphmcquarrie.net. Forty bucks?! It's a steal. What do you think of McQuarrie's art? Do you remember the film and have fond memories like I do?